I donated altruistically to a woman in Pennsylvania. I think I’ll always remember the moment they told me her creatinine levels had gone down to normal. The sun was shining outside my hospital window and my mom and best friend were in the room. I don’t know how many transplants were done because of mine, or who my recipient was... but there's sort of a magic in not knowing, don’t you think? I’ve always felt drawn to organ donation. Ever since I knew what it was, I knew I wanted to save lives after I passed. I didn’t even know living donation was possible until a few years ago. Once I learned about it, I knew I had to do it. I felt like I was called to do it. It’s hard to explain because I don’t feel it’s all that complicated of an answer. 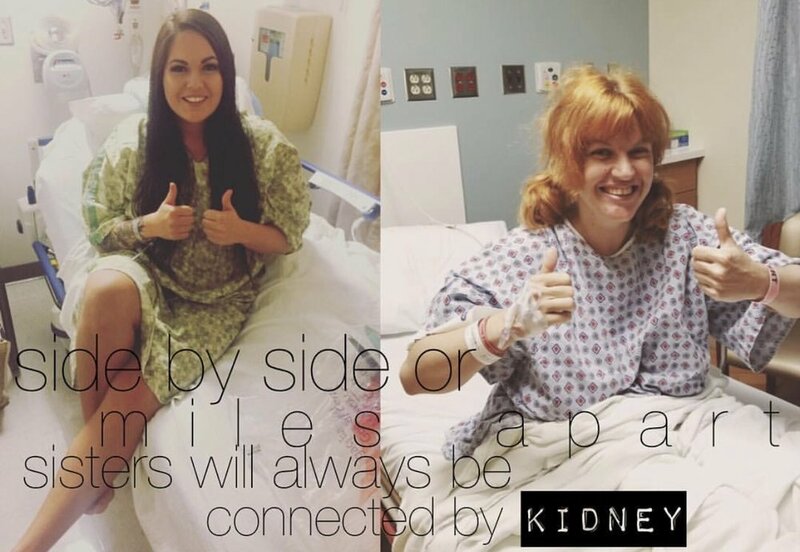 I have 2 kidneys, I only need one, and someone will die if they don’t receive one. Didn’t seem like a tough equation for me to solve. My Sister Sales Director in Mary Kay led me to donation. One had donated to a family member and got me in touch with my nurse coordinator Laurie at Legacy Transplant Services in Portland, Oregon. I know it seems like a lie, but I wasn’t scared or nervous even once. I’ve never been more sure and calm about a decision in my life. I know it was something I was meant for. My career is extremely flexible, which is another reason I did it. I’ve always felt like my biggest reason to be grateful for what I do is that it allows me to be patient and do things others may feel like they can’t. I didn’t have to “miss work”. I just worked around my recovery. And looking back, it wasn’t very inconvenient at all. Because of my career flexibility, I was able to get my testing done quickly. I applied and within 2 weeks was in Portland doing the hospital tests. 2 weeks later we got the OK for me to send my blood to National Kidney Registry Paired Exchange. I was matched a week later and had surgery 2 weeks after that. From the time I applied to the day of surgery was about 7 weeks. I always knew in the back of my mind it would happen quickly. My support was off the hook. Literally. Just not at first. Most times, people that love you are protective of you. Sometimes they think you’re kidding when you tell your parents that you’d like to get a perfectly working kidney that they created for you CUT OUT of your body. Immediate reactions were definitely shock, denial, and sometimes irritation. I’ve learned that people react to this many different ways, and no way is technically “bad”. If you don’t get the reaction you’re looking for, remember that not everyone has the same dreams and heart that you have. Many people won’t understand why, but they’ll support you for donating. Family might not be supportive until after surgery is done and they know you’re okay. It’s your path, do what you know is right and the rest will fall into place. It really does change your life. It’s so cliché but it’s true. I bet it will be one of, if not THE best decision you make in your life. I truly believe that ideas are placed in your heart for a reason. We truly can save others' lives with our own. The sense of purpose that you feel afterward can't be matched. I’ve heard of phantom limb syndrome, where when someone loses a limb they feel it there... almost like it’s not gone at all. I feel that way sometimes. Sometimes it’s almost unnoticeable, but I believe sometimes even across the country... 2,000 miles away... my recipient and I think about each other at the same moment, even if it’s subconsciously. My body isn’t just my own anymore. I’m part of her and she’s part of me. Forever. The hardest part about living donation is only being able to do it once. Rachel (left) in Oregon and her recipient, Valerie, in Pennsylvania the day of their surgeries.